It’s snowman weather again! Pip the rabbit and Posy the mouse are having fun in the snow but they just can’t agree on what to build! Can they find a way to resolve their differences and play together nicely in Pip and Posy: The Snowy Day? The Story: Pip and Posy wrap up warm and go out to have fun in the snow. They sledge, make snow angels and catch snowflakes on their tongues but things get difficult when they decide to build a snowman. Pip wants to build a rabbit but Posy wants to build a mouse and neither of them want to back down! After some pushing and snow throwing they manage to resolve their differences before going inside to make lots of different animals with their playdough. This is a lovely story about having fun in the snow and it also effectively includes the concepts of resolving differences, dealing with a situation that isn’t going your way and learning how to apologise. My daughter thinks it is funny when Posy throws snow at Pip but I think the whole conflict situation with a hug to follow has been beautifully written and is a great way of showing small children how they could also deal with a similar experience. The range of emotions that Pip and Posy go through are wonderfully portrayed in their expressions and the pictures are bright and bold. The text is simple and Axel Scheffler’s illustrations are full of detail, my daughter loves the double page spread where Pip and Posy are sledging with all their friends. 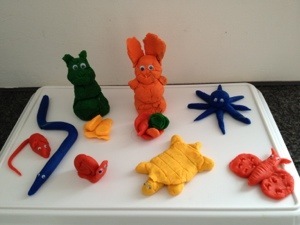 The Snowy Day inspired us to get out our playdough and make lots of different animals too! 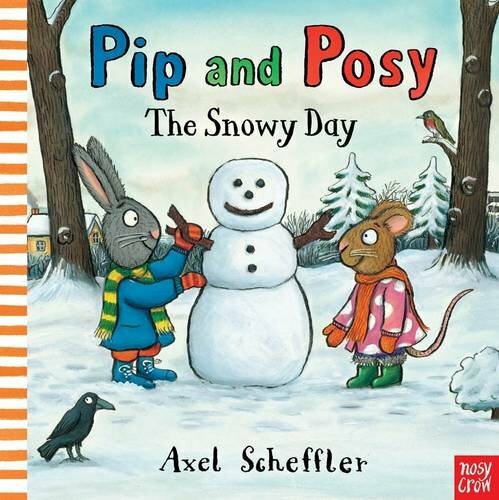 Thank you to Nosy Crow for sending us a copy of Pip and Posy: The Snowy Day after I wrote a guest post about Pip and Posy: The Little Puddle. I was not asked to write a recommendation for this book but I wanted to because we think it’s a great book! Great to see it inspired some play! I got the idea for using googly eyes with playdough after reading your Babapapa blogpost! We had a major Pip & Posy phase a while ago – they’re so nice and ordinary but big issues for small children. Pip and Posy’s experiences are very easy for young children to identify with and they love the pictures too. I think they’re a definite must for a toddler’s bookshelf! These are great – I wish we had snow where I live!